Corner Depth - 37 7/8"
What could make an already great fireplace truly outstanding? The right high-quality mantel, such as this Empire EMBC11S Corner Wooden Mantel Cabinet with Base. With one of these hearth accessories you can transform your fireplace into a home furnishing capable of enhancing any room. The Empire EMBC11S Corner Wooden Mantel Cabinet with Base is not your average fireplace surround. Skilled workers carefully inspect each of this mantel's cabinetry-grade components, then hand-coat them with a specially-formulated finish. The result is a mantel that is not only more uniform and durable than those produced by Empire's competitors, but one that is infinitely more attractive. A fireplace is a big investment. So why not make the most of yours with an eye-catching Empire EMBC11S Corner Wooden Mantel Cabinet with Base? 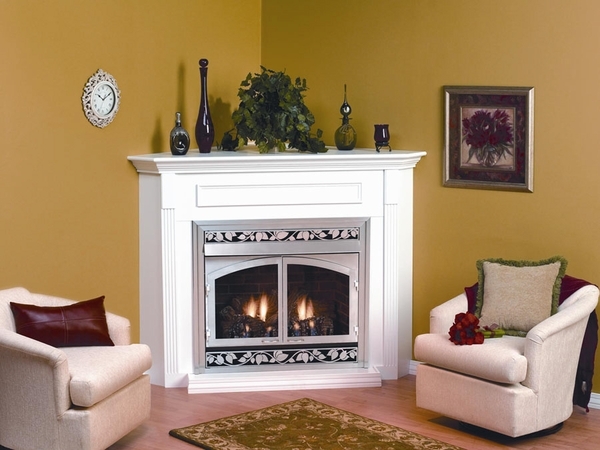 Mantel shown with white finish and a separately purchased fireplace. I want to see the footprint (bottom view) of the corner cabinet/mantel (EMBC11S) to accurately build a base and stonework. How can I find this detail? The dimensions of the mantel can be found on page 5 of the manual linked here.